She is, after all, an uncompromising Right-winger known to harbour grave doubts about the wisdom of blowing so much money on aid. Ms Patel seems determined to shake up her sanctimonious department, though her room for manoeuvre will be limited. There is no doubt it makes sense to spend less on vainglorious aid projects and more on our own defence, given Middle East instability, jihadist atrocities and Russian provocations. We must hope Ms Patel does not become seduced by flawed concepts of saving the world. Development news:JK Rowling takes on voluntourism; MSF, Kayla Mueller and caring for humanitarian aid workers; let’s talk fraud, NGOs! The overworked nonprofit employee is the new normal; are aid organizations wasting money in rural Nepal? Academia:Why don’t students read? Can you fix the academic conference business? In the end, Ellis is careful not to buy into a simple globally organized crime narrative with Nigerians at the heart which ‘underestimates the degree to which business, organised crime and politics have become integrated through their mutual interests’ (p.229). As my academic summer break is coming to its end, I am keen on sharing another book review with you. 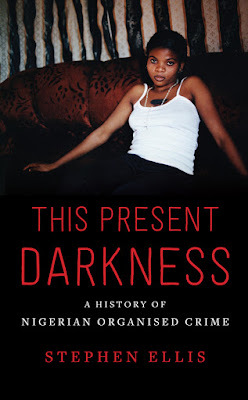 This Present Darkness: A History of Nigerian Organised Crime is one of the most extraordinary books I have read in a long time. The book follows, supported by stunning and meticulously analyzed archival data, about 100 years of Nigerian history through a wide, constantly refocusing lens on ‘organized crime’ from early 1920s mail order scams to the political corruption of the oil boom to today’s cyber scams. But if you are expecting a journalistic expose filled with juicy details of crime and corruption, a culture-deterministic review of ‘the Nigerians’ and their skills to defraud or steal or a singular narrative blaming things on colonialism and capitalistic natural resource governance you will be pleasantly disappointed. Happy World Humanitarian Day, happy Friday and happy reading with this week's link review! Development news: UN admits role in Haiti cholera epidemic; World Bank economist writes reflective blog post; New leader, old debate: Who’s going to head the Bank? Participation and inequality; Kenya’s NGO crackdown to silence critics? How academics and NGOs can work together; cards against humanity; Pakistan’s truck art. Our digital lives: Photographing Justin Trudeau; Neglecting the floods in Louisiana. Academia: Female economists & patriarchal higher education; a long read on mindfulness and political self-exploitation. 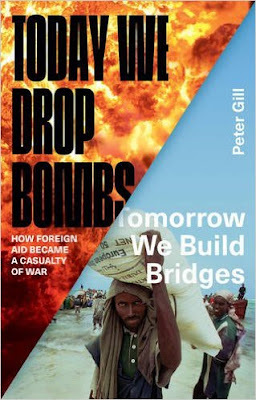 It is the 2016 World Humanitarian Day today and publishing a review of Peter Gill’s Today We Drop Bombs, Tomorrow We Build Bridges: How Foreign Aid Became a Casualty of War is a fitting contribution to a rapidly changing humanitarian aid environment. Gill’s book is an engagingly written hybrid: Not academic, but reflective and well-sourced; more than long-form journalism from conflict zones around the world, but not a ‘war correspondent tells all’ memoir; excursions into the history of the humanitarian system with plenty of contemporary insights and food for thought for the future. It is a very good resource to discuss the changing nature of the humanitarian system and at the same time accessible to ‘civilians’, aid workers or students who are looking for supplementary reading on the realities and complexities of the humanitarian aid system in ‘the field’. TGIF! Time for a fresh link review from the wonderful world of development, digital culture and higher education! Development news: The #allmalepanel gets a thorough feminist academic treatment; TV program on medical volunteerism; localization of aid without creating a new class of globalized organizations; giving refugees cash; from DRC to PNG-the difficult engagement with extractive industries; on the road with Afghan migrants; what really happened to Dag Hammarskjold? Who does ‘aid work’? Our digital lives:…and I didn’t even get the T-Shirt-feminist writing in the age of new capitalism; Airspace: How platform capitalism helps to create familiar experiences in distant locations; the darker sides of authentic Internet fame. Academia:Proud not be a ‘serious academic’; theorising digital scholarship.